If you're planning on participating in the Port to Fort race this year and would like a team shirt, I finally came up with one I thought suitable for kids and adults. I wanted it to honor Henry and also to be colorful and happy. I've marked the items up $5 each which goes directly to Alex's Lemonade Stand Foundation. There have been several things I've been meaning to share here recently. 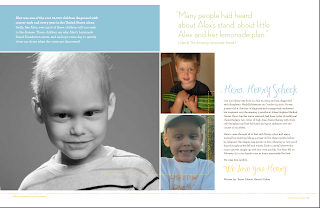 Alex's Lemonade Stand Foundation asked a while back (sometime last year) if they could use Henry's image in their Annual Report. It's come out and while not in hardcopy, they did distribute it as a PDF. Here is the page with Henry. The Believe in Tomorrow folks that do the Port-to-Fort (Sunday 4/25) wrote a note to some of last year's participants to ask a few questions. We were privileged to do so and our 'Life is Fragile, Love is Not' team features in their March eNewsletter. Some of you have asked if we'll have a team t-shirt this year. I'm on it, but just a little slower. Check back soon and I'm hoping to have something for us to wear. I'm thinking of something special for the little participants too. Finally, I have to thank you again for the support you've given to our family, particularly over the past year. 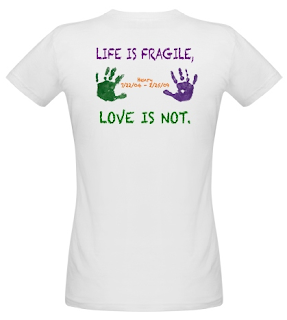 We look forward to seeing you at the Port to Fort walking or running with Team: Life is Fragile, Love is Not.